Bake a sheet cake the size that you will need. With an icing filled bag and round tip, size #5, draw Barney’s face on the top of the cake. Cut the cake from around the outline of Barney’s face that you drew on the top of the cake. Using the pieces that you cut away to make Barney’s cheeks fatter. You will be using the star tip, size #18 to fill in and cover Barney and the round tip, size #5 to do all of the outline work. With black icing, fill in the pupils of the eyes. With white icing, fill in the teeth and the white of the eyes not forgetting to put a small white dot on the black pupils. Use a tan colored icing for the eyelids. Use red or pink icing to fill in the mouth. Next, make a reddish purple icing and cover the rest of Barney’s face. Now do your outline work. Use a round tip, and black icing and make a line between the eyelid and eyes. 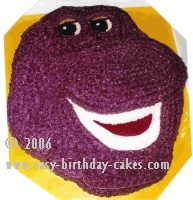 Now use your purple icing and round tip and outline the entire face of your Barney birthday cake. If you have made a Barney cake that you would like to share, please submit your cake here and let us know how you made it! We would love to feature your cake on our site. Please make sure to include a photo of your cake and a description of how you made it, so that we can all share ideas and learn from each other! See Barney Cakes That Were Submitted By Others To This Site!